can anyone give a loc for this npc? He's in the same room as Minister Larnum. He is in the same temple as Lcea, on the back side. I was dubious with this guy, probably due to killing a couple of citizens to test the XP. Wasn't very good so that was a stupid move on my part. 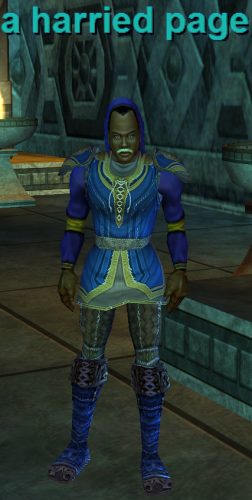 My other toons started "apprehensive" with this guy so it only took a couple of kills to get my faction down to dubious. However, SNEAK works with him as long as (a) you CAN sneak, (b) you get behind him, (c) initiating SNEAK works and (d) you do it each time you have to talk with him during the quest. Lesson to be Learned for Moi: don't kill humanoid mobs without checking the significance of their faction... first! Much ado about nothing, really, since killing a few Sarnaks in FM restored the faction. You get -1 to the Combine factions for killing citizens and +1 for killing Sarnak type mobs. Correct. Most Lceanium and The Overthere outpost NPC's are on the New Combine and New Combine Guards faction.